Lexington Farms, a single family affordable housing development in Illinois, looks to be LEED Platinum and net zero via clean energy on each house. Here’s a gust of new information about wind farm efficiency! A nicely written article explaining the shading effect and boundary layer influence on turbine placement for wind farms. A good example of the need for integrated design and engineering. Everyone’s familiar with the ‘shading effect’ that occurs on solar energy schemes. If a tree or high rise building casts a shadow on your photovoltaic cell’s glass face, that means your system isn’t generating as much energy as it could, because it’s not catching as much sunlight as it could. The Horns Rev wake effect, in the North Sea. Picture courtesy renewableenergyworld.com and NOAA. 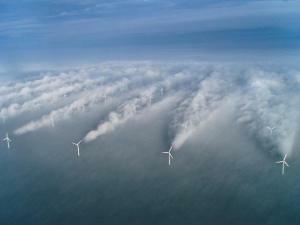 But did you know that wind turbine farms are hindered by a similar phenomenon? It’s known as a wake effect, and oftentimes, it’s caused by the wind turbines themselves. A now famous picture of the so termed ‘Horns Rev wake effect’ was taken off the coast of Europe in the North Sea of an offshore wind farm. In contrast with dedicated power only biomass plants, biomass-fired combined heat and power installations are continuing to attract investment in the UK, given that they still qualify for significant government support. A number of these projects have made advances over the previous few months. For instance, RWE Innogy UK (formerly RWE npower renewables), is in the final stages of commissioning its Markinch Biomass CHP plant in Fife, Scotland. This 65 MW plant will supply up to 120 tonnes of industrial steam per hour to paper manufacturer Tullis Russell. RWE Innogy is investing some £200 million (US$300 million) in the development, which was built by Metso and Jacobs. In October 2013 Estover Energy revealed that planning consent has been granted by Dover District Council for its proposal to develop a £65 million (US$100 million) biomass-fired CHP in the South East of England at Sandwich, in Kent. Generating 11-15 MWe and 8-12 MWth, the plant will use locally sourced low-grade wood as fuel. Construction is forecast to begin in spring 2014 at the Discovery Park science and technology park.